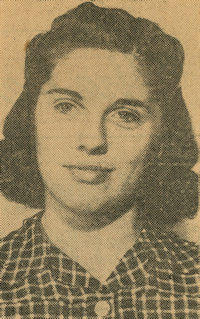 Obituary – Hardin, Philamene Rose (Lindeman) « Perry High School Alumni Association, Inc.
﻿- daughter of Mr. and Mrs. F. W Lindeman, was born on June 7, 1924 in Perry, and attended St. Joseph’s Academy in this city as the only other school other than the Perry public schools which she has attended. During the five years in which she has been a student of the Perry schools, Philamene has won three letters in band and has been president of her home room. She appeared in her junior class play. Philamene has not definitely decided what she will do after graduation this month. Philamene Rose Lindeman Hardin of Houston, TX, passed away April 5, 1999 after a long illness. She was born June 7, 1924, in Perry, OK, the daughter of Carrie M. and Fred G. Lindeman and was a 1941 graduate of Perry High School. She married Orval W. “Red” Hardin on December 27, 1949, at St. Rose of Lima Catholic Church in Perry. Survivors include her husband; sons, Fred G. Hardin and Jon V. Hardin of Huntsville, AL; daughters, Mary Jane Hardin of Houston and Elizabeth Hardin Nutt and son-in-law Bill Nutt of Brenham. She was blessed with three grandchildren, Jason Nutt and Jeffrey Nutt of College Station and Austin Hardin of Ripley, TN. She will be remembered by her sister, Ruth Lindeman Queen of Perry, OK and sister-in-law, Grace Hardin Carter of Scottsdale, AZ, along with her numerous nieces and nephews. She was preceded in death by her parents, Fred and Carrie Lindeman, Perry; and two sisters, Mary Powers and Lucile Kraft Cain. Services were held Thursday, April 8, 1999, at St. Matthew the Evangelist Catholic Church in Houston, TX.